People walk past Iron Labs, one of five new businesses launching in CitiPark through Project: PopUp. Carrie Pendergrass, right, cuts fabric for Matt Irvin Wednesday at Sewn to the Sky on Chestnut Street. The shop is one of five new businesses launching in CitiPark through Project: PopUp. An formerly-empty downtown block comes back to life today. Downtown development group River City Company is helping launch five new businesses in CitiPark at the corner of ML King Boulevard and Chestnut Street through Project: PopUp. The five businesses in the project get free rent for six months and about $3,000 each to help with build outs. Altogether, the businesses will receive about $15,000 in construction aid, $30,000 in marketing and promotion and $100,000 in rent assistance. "One of our goals at River City is to bring more retail to downtown. With the down economy, relocating or starting retail business isn't exactly a hot trend," said Tiffanie Robinson, creative strategies director at River City. "The goal is to get them to stay open for a long period of time." Robinson couldn't point to one specific reason why developers have long struggled to find tenants for the units along Chestnut Street. She hopes all five new businesses will thrive, but if just three remain in the area after their six months of free rent are ups she'll consider it a success. Two of the businesses, Iron Labs video game competition promoters and Sewn to the Sky gift shop, have been open for a few weeks. The rest of the businesses either open today or in the coming weeks. Though some long-established businesses along the road remain successful, drawing new tenants was a challenge without a critical mass of retailers. This project was aimed at enticing enough retailers with similar goals to make all the projects successful. "The fact that there's five of us going in, we have different demographics we draw from, it creates a lot of traffic," said Tony McInnis, owner of the new Tasty Daylight Donuts. "There's power in numbers. All of us doing this at the same time together allows us to do more things than if it were just us on the corner." Without the project, McInnis wouldn't have been able to open his new downtown spot. 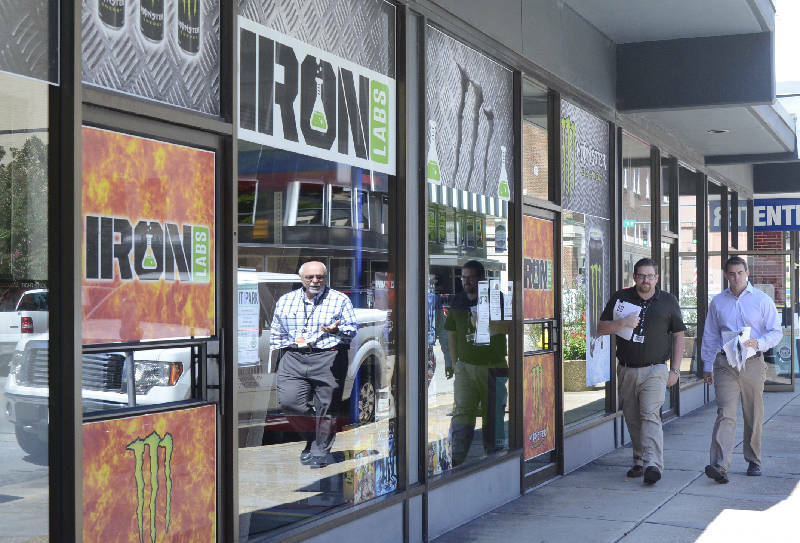 With businesses pulling tens of thousands of employees into the downtown area every day, he is confident his shop will thrive. "Who doesn't like coffee and a donut in their meeting?" he said. "It's just a great opportunity to put our product in front of more people." All five of the retailers are businesses likely to keep people hanging out downtown after work. The group was selected from 30 applicants by a panel of downtown business owners and River City Company employees on the merit of their business plans, their professionalism during interviews and their financial situations. Jennifer Bleasdale, owner of pop up business Go Bagel, considers the project a huge help to her business, but also expects her business to help the downtown area. "We think of it as a two-way street. This is an area of town that needed some more business to occupy it, we in turn are receiving some assistance," she said. "I think of it as a synergistic-type thing that will work great for both of us."